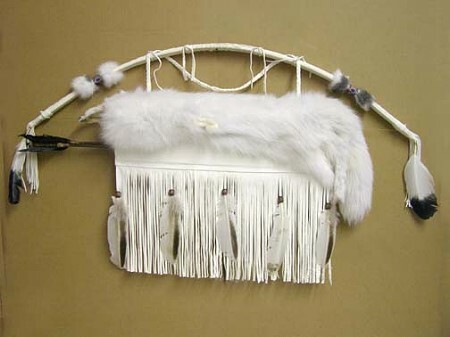 This is the ARCTIC FOX BOW & QUIVER. 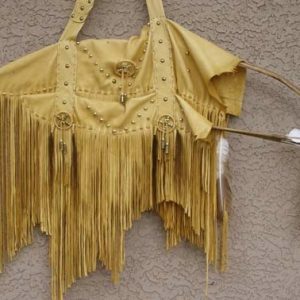 The bow measures 44″ in lenth & is completely wrapped in matching white buckskin leather with sections of seed bead work on the upper & lower limbs, surrounded by bits of fur & finished with feathers & fringe. 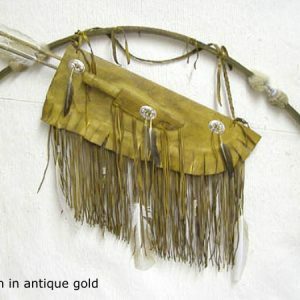 It also has a braided leather strap. The quiver measures approx. 24″ on length. Inside the quiver are two (2) hand made arrows with either bone or pewtwe(metal) tips. Additional arrows may be purchased separately. 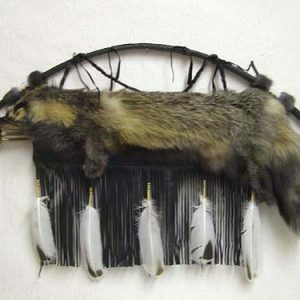 It features an authentic full arctic fox fur pelt which lays over supple white buckskin leather. 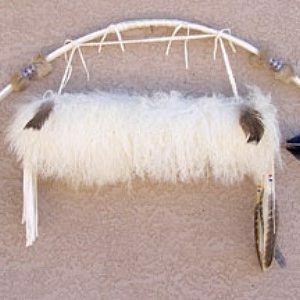 This plush bow & quiver is handcrafted by Cherokee artist ‘Wetfoot’ & comes with a Certificate of Authenticity.